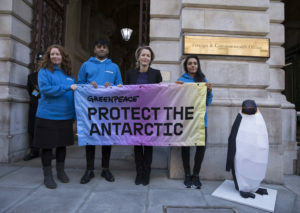 Our Antarctic Ambassador, X-Files and The Fall actress Gillian Anderson joined Greenpeace UK on the 9th October to deliver our petition to the UK Foreign Office to Protect the Antarctic. The decision on whether to establish an Antarctic Ocean Sanctuary was made at the Antarctic Ocean Commission (CCAMLR) in Australia last week. It was an opportunity to create the largest protected area on Earth – a 1.8 million sq km sanctuary, five times the size of Germany. Unfortunately, the meeting ended in a rejection of this proposal. While it means that we have to go back to the drawing boards, we shouldn’t forget how much support was showed by supporters in the build up to CCAMLR. Greenpeace wanted to use this hand-in as an opportunity to thank every single person who has shown their support, with over 350,000 people having signed our UK petition. Gillian Anderson brought with her a vintage suitcase which contained a pop-up photomontage, and a number which represented the amount of people who have currently signed our UK petition calling for an Antarctic Ocean Sanctuary – 355,655 people! We do petition hand-ins for many reasons at Greenpeace. They can be very useful for getting media attention on our campaigns, but they are ultimately about making sure that decision makers are aware of what people are asking them to do. In this case, we called on the UK government to give top priority to the establishment of the Antarctic Ocean Sanctuary in Hobart. In the weeks leading up to the UK petition hand-in, I had the responsibility of creating and delivering our petition hand-in concept. 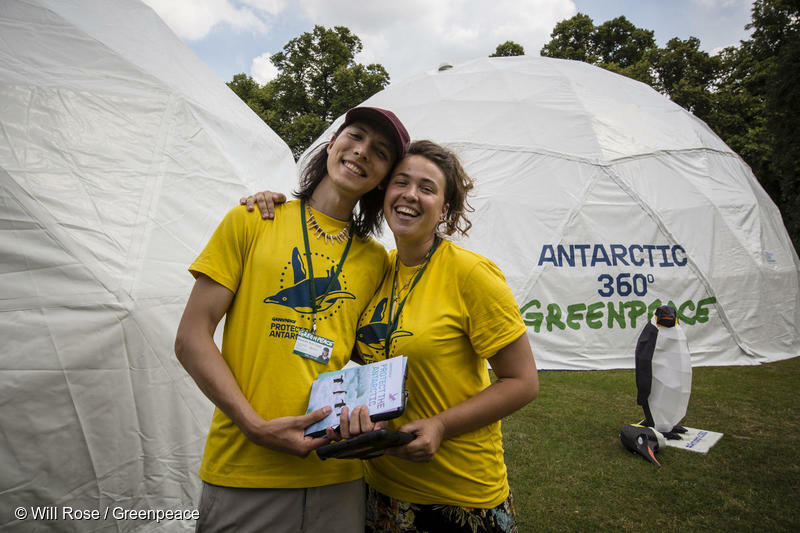 Presenting our petition as a suitcase was an effective way of showing how Greenpeace’s Protect the Antarctic campaign has travelled around the country to capture and deliver the voices of over 350,000 people to the doors of the UK Foreign Office. 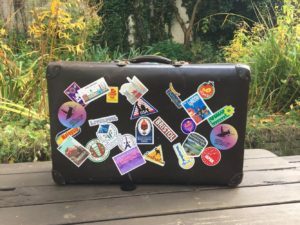 Many of the stickers covering the outside of the suitcase came from different parts of the UK, to show how people from all over the UK had come together to create a voice which resonated all the way to Whitehall. We wanted to especially show how an individual act, like signing a petition, can resonate all the way to the global arena of the Antarctic Ocean Commission in Australia. The international stickers represented the global movement of this campaign (over 2.5 million have signed our global petition!) and to urge governments who haven’t shown their support to do so. With the help of experienced pop-up makers, we created a concept inside the suitcase that clearly represented some of the most effective aspects of this campaign. The pop-up was built from a photomontage of supporters holding signs in several different languages – it was a clear sign of this campaign’s global reach. All the around the world, the Antarctic’s beauty is appreciated, and all around the world people have realised this beauty faces a very real threat. 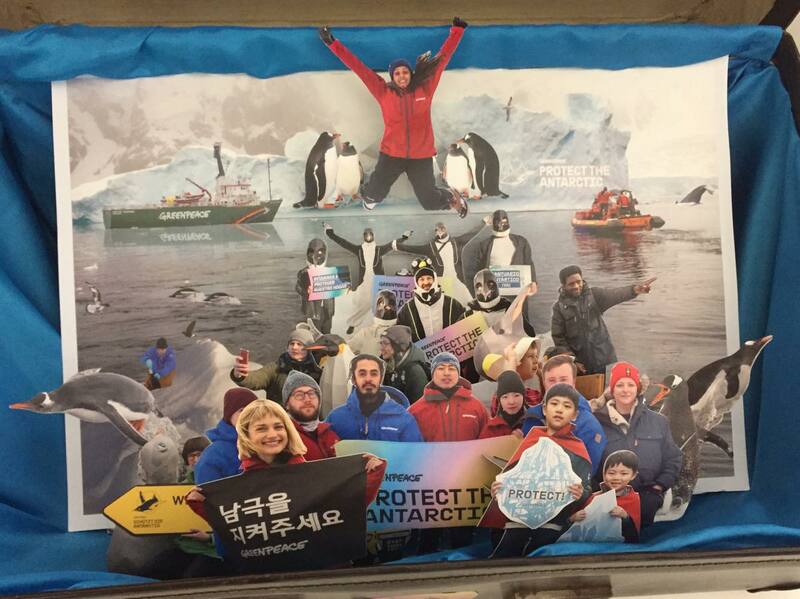 Some of the photos also included other celebrity Antarctic ambassadors ( ‘Stranger Things’ star David Harbour and ‘Fantastic Beasts’ star Alison Sudol) who have use their influential platforms to increase awareness of this campaign. The petition hand-in was also an opportunity to thank them as well. The visual elements of this event had an important function – to ensure that Foreign Office officials appreciated the Antarctic’s beauty, and to remind them people both at home and abroad were calling on them to say yes to an Antarctic Ocean Sanctuary. Despite their failure to do this, the immense support behind this movement sheds a promising light on what is to come. Our mission to protect the Antarctic is far from over.